Vol. II lazily re-uses a lot of the artwork from Vol. 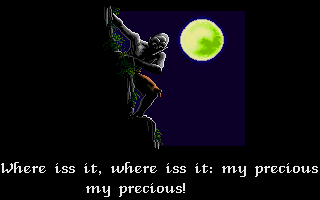 I, including the title screen. I remember approaching Lord of the Rings, Vol. I with some trepidation, not much of a fan of the source material, not looking forward to a game that recapped a plot that everyone already knows. Role-playing a defined character with a predestined fate, I reasoned, removes any sense of player investment in the character. Meanwhile, if the game simply follows the plot of its source, there's no fun in exploration and no surprises; but if it allows all kinds of diversions, the player is jarred by the dissonance with the source. 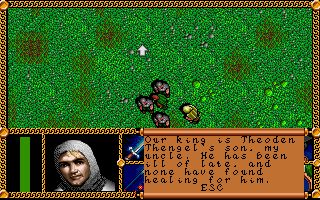 The game starts with a recap of the story from the beginning. I was thus surprised to find most of my worries unfounded. Vol. I plays like an alternate-universe execution of Fellowship of the Ring--one that begins at the same location as the books but is then free to go off in its own directions. The player can make any character in the Fellowship the ring-bearer. All kinds of non-canonical NPCs can join the Fellowship, including some created just for the game. Even Gollum can join. The open world is full of side quests that Tolkien never envisioned. 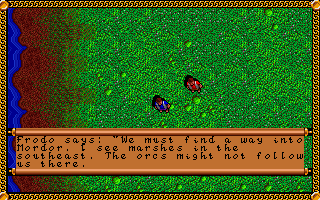 And it's completely non-linear: a player can exit Moria, turn around, and walk all the way back to the Shire. He'll even encounter new situations and quests if he does so. And it turned out that none of these departures from the book bothered me at all--although we must remember that I wasn't much invested in the book in the first place. The opening to Vol. II makes me wonder if the developers retained this admirable freedom. The backstory makes this game more of a sequel to the original material than to Vol. I. 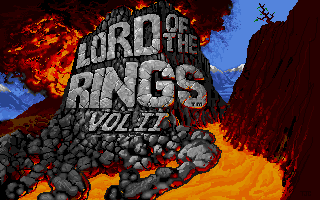 The first game ends with a non-canonical episode in which the Witch King kidnaps Frodo and Sam (or, I guess, whoever has the Ring) and the rest of the Fellowship has to rescue them from the fortress of Dol Guldur (and keep in mind, depending on the player, the "rest of the Fellowship" might include none of the canonical members). 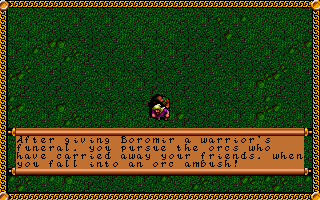 The game thus ends on a triumphant note, before the betrayal and death of Boromir, who might not even be with the party. The intro screens elide some unpleasant events. The backstory told in the opening screens of Vol. II omits the business with Dol Guldur and jumps ahead in time to a point past Boromir's death, the kidnapping of Merry and Pippin, and the division of the Fellowship. It begins with Aragorn, Gimli, and Legolas (who wasn't even in my Vol. I party) on the plains of Rohan, following the trail of the orcs who kidnapped the hobbits. I didn't expect the developers to emulate Crusaders of the Dark Savant and offer a different opening for every potential end state of Vol. I, but I was surprised that the game doesn't even import the save file or offer any concessions to the variances in the plot. As I began, I hoped that didn't mean that it wouldn't feature the same spirit of open exploration and side quests that we found in its predecessor. The manual does suggest that Vol. II is more interested in adhering to canon. Among other things, it makes a distinction between canonical members of the Fellowship (Frodo, Sam, Pippin, Merry, Gandalf, Aragorn, Legolas, and Gimli)--who can die but will otherwise never leave the party--and "temporary NPCs" who might join for a little while, but only until their personal missions are fulfilled. 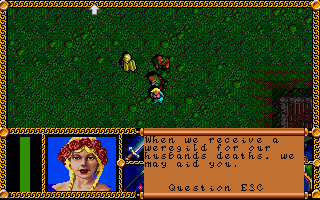 There were some of those temporary NPCs in the first game, too, but generally you could trust that anyone who joined your party would stick around to the bitter end. There is thus no character creation process. Characters come with preset levels in certain attributes: dexterity, endurance, life points, strength, luck, and will power. They also come with a variety of active skills, combat skills, and lore. "Active" skills can be directly employed by the player and include such options as "Climb," "Detect Traps," "Hide," and "Boats." Combat skills are used automatically in combat, and lore--including orc, dwarf, wizard, and elven lore--are similarly passive. Skills and lore are binary; you either have them or you don't. The main interface and its various commands are activated with the SPACE bar. You may recall that Vol. I was reissued in 1993 on CD-ROM, with artwork created specifically for the game replaced with scenes from Ralph Bakshi's 1978 animated film. It also improved several aspects of the interface. (I started with the earlier version and finished with the later version.) Vol. 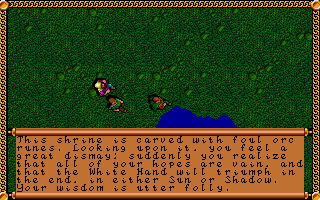 II, developed in between the two releases of Vol. I, benefits from some of the interface improvements but not all of them. The party cannot move diagonally, for instance, but the main actions on the bottom of the screen--attack, view, get, inventory, skills, magic, talk, set leader, and game options--are easily called by keyboard commands. 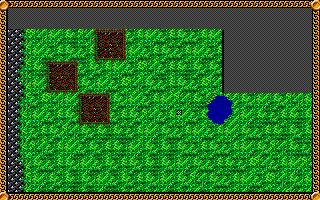 There's also an automap, which reveals itself in large squares. When you turn the interface off, the exploration window is completely uncluttered, which I like a lot. The automap fills in by large squares. 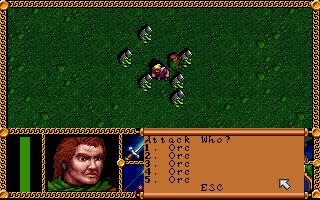 The game begins with the three companions locked in battle with half a dozen orcs. Combat hasn't changed from the first game. You select "Attack" then specify the target from the list, with wounded and near-dead enemies annotated with special symbols. Enemies get their turns after the Fellowship members, and sometimes the Fellowship gets a free turn. I'll have more on combat later once it comes back to me. In the midst of a melee. My party destroyed the orcs handily, after which Aragorn did some tracking and noted that the trail of the kidnappers leads north and that the hobbits needed to be rescued at once. So naturally I decided to make my way north via east-west sweeps of the area. (Hey, I was trying to spare Aragorn a broken metatarsal as long as possible.) The eastern border of the opening area is water--I guess the river Isen--and the western border is the uncrossable Misty Mountains. The southern border is open, and you have to be careful not to cross it because the game forces you to switch parties, with I-don't-know-what consequences for the initial trio. Walking alongside the Misty Mountains. Remains of an orc encampment with some rations and ale. A party of random orcs. Once I killed them, I found a sigil with the white hand of Saruman on their bodies. Note that there are no actual orcs on the screen until after I get the message. Athelas, which Aragorn can use to heal wounds. 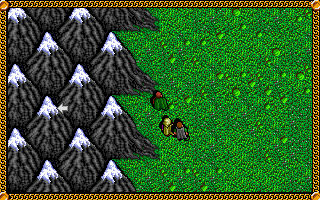 A Rohirrim warrior named Dorlas, hiding in the bushes, claiming to be hunting orcs who burned his town of Estemnet. He told me that a wizard has been seen on the edge of Fangorn Forest and suggested we look into it. In follow-up questioning (you talk by typing keywords, probably one of the last games in which this is true), he told me that the King of Rohan is "all but dead" and that a "craven council" rules in Edoras. He spoke of Saruman as an enemy, so his betrayal is clearly already known. Dorlas popped up several times. It got kind of annoying. This doesn't seem to be this Dorlas. A man named "Walcnoth" who just stood there and wouldn't say anything to me. Three uruks trying to capture a black steed. They attacked as we approached. There were two such encounters. The ruins of Estemnet. A warrior named Bregowine gave us a meal, which healed all our accumulated wounds. Most of the other citizens were angry and bitter about the failure of their king, Theoden, to protect them. The leader, a woman named Leofyn, said that the town wouldn't be helping anyone until "a weregild is paid to compensate us for our losses." Specifically, she wanted her husband's sword, a bag of gold, and the return of her son, who had taken off, vowing to avenge his father. The sword and gold had both been stolen by orcs, with a camp to the north. This was the same portrait they used for Galadriel in the last game. A warrior named Heof. He offered to teach us the "Riding" skill (how is it possible that Aragorn doesn't already know it?) if we solved a sub-quest to destroy a shrine that the orcs placed in a sacred pool used by the mearas (cool horses). The shrine couldn't be harmed during the day, and at night it's guarded by "spirits of evil." I left this for later because I wasn't yet sure if the slight darkening of the sky that happens every few minutes is "night." A group of horsemen led by Eomer. He said that they had slaughtered a group of orcs, didn't know anything about hobbits, and not all was right in Edoras. Basically the same as the book. Eomer says nothing about being banished. In a burned area north of Estemnet, I found the orc encampment. The game warned me that there were too many to fight, but I bungled my way into it anyway. I defeated the first party of attackers but died at the hands of the second. If we all die, Satan gets the ring. After my defeat and reload, I changed my exploration pattern, going all the way north along the River Isen to Fangorn Forest. A path led into the forest--which is anything but dark and brooding--and it wasn't long before we found Gandalf. Saying his name snapped him out of his reverie. He explained that Merry and Pippin were safe with Treebeard and that our priority should be to stop a trio of "messenger orcs" on their way to Saruman (perhaps the same party I already killed as above? ), then see about helping Theoden. Fangorn! What madness would make us hesitate to go in there? At this point, the game decided it was time to switch the action, and it loaded up Frodo and Sam on the edge of the Dead Marshes. There doesn't seem to be any way to manually switch between the parties, so I guess the game will do it automatically when certain plot points occur. I wonder if there's any way to artificially unite (or even switch!) the parties. I guess I'd have to find a way across Isen first. I don't care what's canon; I'm glad the films didn't make the hobbits look like goofy old men. The game had us distribute the gifts from the elves (two cloaks, magic rope, lembas bread), after which Frodo recommended that we approach Mordor via the marshes to the southeast. The Dead Marshes, Frodo. Yes, yes, that is their name. The exposition with Leofyn was delivered via a written paragraph in the manual. Vol. I had these, too, but the re-release put all the text in-game. This has to be just a copy protection exercise because the game certainly hasn't been shy about long in-game paragraphs otherwise. Flashbacks to Pool of Radiance! I'm not really sure how experience and leveling work. The manual assures that your statistics will increase with experience. I forgot how it worked in the first game. 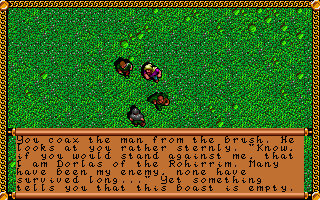 Sound effects are sparse except during combat, when there are about three: a thunk of connection, a whoosh of missing, and a scream of death. The manual devotes a lot of space to the History of Middle Earth and a glossary of characters and places, enough that I learned quite a bit despite having been exposed to this material before. The manual also philosophically questions whether Tolkien himself would have approved of a computer game based on his work. I'm not going to have a lot of patience for this. The events of the opening area ultimately assuaged my concern that Vol. II would be too linear and plot-driven. I look forward to seeing how it develops. I suspect I'm due for an encounter with Gollum soon. Can I be smarter than Frodo and just kill him? Non-sequitur: I had this dream the other night that the nation of Denmark hired me to create an official Danish tabletop RPG (this despite my lack of experience with tabletop RPGs). The scenario was to be that the melting ice sheets in Greenland were slowly uncovering an ancient civilization. I invited several of you to be a part of the team, and we had a very contentious meeting in Amsterdam (yes, I know that's a different country--I'm just telling you what my dream was) where some of you wanted to make it a pure exploration/archaeology RPG while others wanted to have, like, ice giants awakening in the melting glaciers. Lately, I've been in the habit of writing down dreams that I think might lead to good song, story, or game ideas. I don't always hit a home run. The other night, I wrote (I have no memory of this): "Bacon-wrapped chocolate coin. The coin has an image of a woman on it, and you have to convince her to submit before you can eat the bacon." That one doesn't seem so promising now. But the idea of an RPG set in an ancient civilization slowly uncovered in Greenland actually seems like a good one. Anyone has my permission to use the idea. From my experience, I could never find a pattern for the switch between parties. I remember following main quest and the party switching, and I remember restarting the game and not following main quest and party still switches when I'm exploring in the middle of nowhere. From what I recall, it's triggered by specific events. You reach a particular point in the narrative, and the switch occurs. I don't think there is a timer. I don't think Frodo and Sam would have stood much of a chance without Gollum. Putting aside what happens at Mt. Doom, do they even make it that far without Gollum as a guide? I hope the game does let you kill him and then leaves you with no alternative but to try to sneak through a fortified gate. 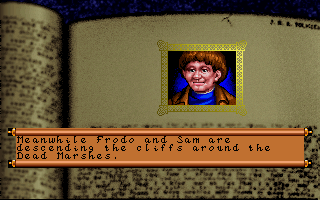 Sam: "Don't worry, Mr Frodo, I discarded the pre-made version of Samwise because 'gardening' and 'pipe-smoking' looked like dump stats and I've instead given him about a million points in tracking and navigation and also he wields battleaxes now. But enough about me: what useful adventuring skills did you buy?" I love the Greenland dream idea! I'm likely on the ice giant side of the debate. Alternatively, the game could be a warning about the dire consequences of civilization-accelerated climate change. A more realistic approach would work better with that "message game." Sounds like it could be a scenario in the Call of Cthulhu RPG, where ancient evil slumbering under the ice for millennia slowly awakens. Not going to comment the bacon dream. After reading your accounts about "War in Middle Earth" and "The Lord of the Rings, Vol. I", I decided to gather more information about all the video games based on Tolkien's books (this is the summary of my results: https://strategywiki.org/wiki/Template:The_Lord_of_the_Rings ). It is a pity that only 3 Middle-Earth video games out of 35 are role-playing games, and the third one of them (The Third Age) is a consolle game that tells an original spin-off story. If you want to personally destroy the One Ring, I think that your only option is "The Crack of Doom", a 1989 text adventure for Apple II, Commodore 64, and MS-DOS. Looks like there might have been some editing issues since I see fewer than 35 entries listed now, and a bunch of high-profile ones are missing (Third Age, which you mention, but also the last two of the three film tie-in action-adventures, Battle for Middle Earth 2, Shadow of Mordor/War). More interestingly, there are a fair number of non-commercial Tolkien games that might be worth including on this list too, most notably in the lineage of roguelikes descended from Moria (the non-PLATO one). Angband is probably the best known of this family, but while it uses a bunch of Tolkien’s monsters and characters it’s too much of a kitchen-sink setting to really qualify (e.g. there are Middle Earth races, and Morgoth is the final boss, but while it’s theoretically set in the first age you also fight Sauron, Nazgul, Farmer Maggot(!) among other anachronisms, plus there’s a ton of regular D&D type stuff shoved in there too). But there are some variants that are much cleaner in their implementation, including First Age Angband, and most impressively Sil, which I think is the single most Tolkien-esque video game there is - there’s no magic except for various songs and forging items of power, for example. Hard as heck, but a really great game. The Third Age is essentially a Tolkien re-skin of Final Fantasy X's systems, and it does pretty well with it. I enjoyed it thoroughly! I know about the PLATO lineage and the Roguelike genre, but on StrategyWiki they belong to their own categories. About Angband variants, the old ToME 2 (Troubles of middle earth 2) makes it necessary to destroy the one ring in mont Doom as part of its endgame. I personally love this roguelike and I found out that it is still available on some mirrors, even if its creator Dark God has moved on a more personnal project with ToME 4, devoid of all Tolkien references and most Angband heritage (and a really good roguelike too). I liked the Third Age enough to write some mini-guides for it on GameFAQs. Best thing about it was Evil Mode. 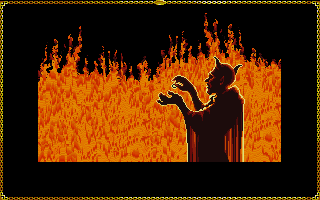 The GBA Diablo clones were okay too and I heard that the PS2 ones were decent if you don't mind that sort of game. 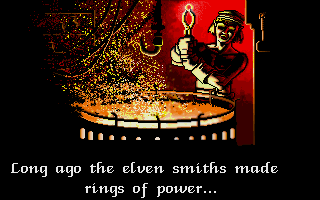 TIL: there were already Lord of the Rings RPGs in the 90s. Have never heard of them before (and I‘m a big LoTR fan). Thanks! Since you mentioned this would likely be one of the last RPGs to have conversations based on typing keywords... I don't know about DOS and Windows RPGs, but Macintosh RPGs keep using that system until far into the late 90s. The first bunch of Spiderweb games (Exile series) uses keywords, as does the excellent but obscure Jewel of Arabia: Dreamers, which is from 1998 if I remember correctly. 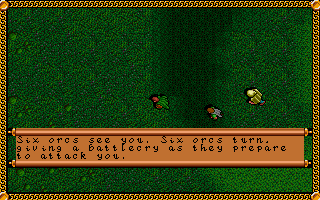 Wizardry 8, from 2001, has a keyword based conversation system that accepts typed input. Fallout 1 still has the option to use keywords. It's good to know there will still be a few. There's a warband level table top wargame with light RPG elements named "Frostgrave" that more or less describes your Greenland dream. The idea being there was a once magically powerful city that got frozen through some unknown apocalypse centuries ago and is just now thawing out, you play as a wizard led group of about a dozen models searching the ruins for artifacts. Yeah, it's also basically the plot to Secret of the Silver Blades. I suppose the only thing I added was making it about Greenland specifically and thus set in the real world. "...a wizard led group of about a dozen models?..." The image of a wizard leading the likes of Cindy Crawford, Kate Moss, Christie Brinkley, Kate Upton, maybe Fabio, and others as they try and battle creatures coming out of the melting ice. "Smarter than Frodo and just kill him?" I know you're kidding, but that's the whole point of the book! Had he killed Gollum, he wouldn't have had the strength to discard the ring, and they would have lost. Although maybe if the third game concludes with the return to non-canonical parties you can be a heroic Boromir who tosses it in. He didn't have the strength to discard the ring anyway! Exactly! Evil couldn't be defeated with strength--it was Frodo and Bilbo's mercy, which preserved Gollum, that caused the ring to fall into Mt. Doom. Gollum's own evil was perverted by their mercy and it caused evil to fail. No pure strength could have stood against the evil of the ring, which corrupted strength. That's why Gandalf couldn't carry it, either. In retrospect, "perverted" probably isn't the right work for talking about mercy frustrating the aims of evil, but I hope the meaning was clear. There is no third game. Indeed, the third game never happened. 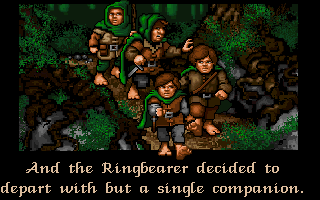 The Digital Antiquarian has an article about the history of Interplay's LotR games. These were not commercial successes, though they were reasonably well regarded. Elsewhere, I've also read that during the development of the third game, they ran into difficulty with the game's story, which just wasn't suited to the kind of RPG that Vol. 1 and Vol. 2 were - all those big battles and armies on the move. You already get some of that in Vol. 2, and from my vague recollection, it wasn't pretty. The result was that Vol. 3 - apparently - morphed into a strategy game, before being cancelled entirely. However, I'm now wary of this story, because a) I can't find where I read it, and b) the Digital Antiquarian documented his story with documents from the Interplay archive, yet he doesn't mention anything about the strategy shift, and I think it's something that would have caught the imagination. A funny thought just occured to me. In an alternate universe, you could imagine Mindcraft getting the LotR license instead of Interplay, in which case the series would be 50% Magic Candle, and 50% Siege. Oh, man. I just went back to the Magic Candle entries of this blog, and read that Ali Atabek actually joined Interplay in 1994. Given that he was the designer for both Magic Candle and Siege, and given that this would have been right around the time Interplay would have been struggling with Vol. 3... that is a very intriguing turn of events. I know Chet likes to turn the music off, but for everyone else I'll mention that the music in this game is pretty good . It's also one of the few games to support stereo OPL music. I bought a release of this back in the 1990s that had the floppy versions of both games. I wasn't really aware of a CD-ROM version. As for the manual paragraphs, I always figured it was a disk capacity issue, but who knows. I've seen paper RPGs trying to do Native American stuff - but I have never seen an Inuit aspect to any. Greenland would be an opportunity to do that. If you like fantasy at all, it's hard not to absorb a lot of LOTR trivia by osmosis alone. - Yes, Vol. 2 does tend to stick closer to the narrative than Vol. 1. However, they do still find excuses to cram a few interesting sidequests, such as the wergild situation you described (all right, maybe that was one of the less interesting sidequests, there are more interesting ones). - I cannot for the life of me recall any interesting NPC characters that could join the party here, other than the ones dictated by the book plot. This may be because I only played this one once, whereas I played Vol. 1 several times, but in general, Vol. 2's conservatism means that quite a few opportunities for diversification are missed. - I was looking through PDFs of the first edition of MERP (Middle-Earth Role-Playing) the other day, as I'm just now trying to write an academic paper on Interplay's LotR games, and so I've been tracing back their influences. I was struck by the fact that while Interplay avoided at all costs importing any kind of world-building content from MERP, they certainly did carry across bucketloads of inspiration for the game's rule set. In particular, the skill system is almost a complete copy of MERP - combat skills, lore skills, climbing, boats, etc. as skills - it's extremely similar. - Interplay's LotR are a very interesting set of games, for the exact same reason that makes them... well, generally good, but never brilliant. Namely, they can't make up their mind if they want to draw more from tabletop RPGs by way of text-based RPGs, or if they want to be full-blown cRPGs by way of Ultima. You've already noticed that these games leave a lot of things to textual description, often to their detriment , not just with things like describing places and encounters, but also with regards to the UI itself (do you want to attack 1. Orc, 2. Orc, 3. Orc, or 4. Orc? :) ). This is one of the last games that I know of, where the classic tabletop RPG mode of delivery, second-person, is utterly dominant. It's especially interesting to compare these games with Ultima VI (which came out within months of Vol. 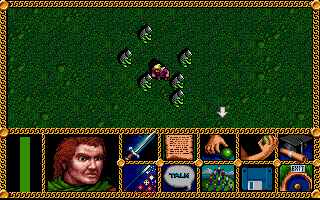 1), and Ultima VII (which came out about a year before Vol. 2). 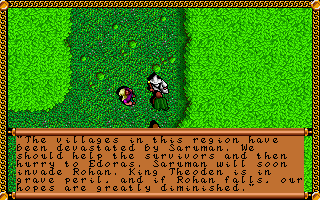 The Ultima series was doing everything they could to replace text with graphics, while LotR stuck with text (and in the case of Vol. 2, it's well worth noting how little the game and UI had changed in the sequel, specifically by looking at how much Ultima changed between VI and VII). I do think this was to some extent a conscious stylistic choice for Vol. 1 - it was based on a book, and it was being designed by a tabletop RPG designer, so going for the more literate kind of text-based descriptions and second-person would have been natural. For Vol. 2., however, I think they must have known this would be putting them heavily behind the curve, but by this point, they also didn't want to commit enough funds to the project to completely re-develop the engine like Origin did each time for Ultima games. Oh, I almost forgot: yes, those darker bits are night. The day-night cycles in LotR are very fast, and not all that visible. It's nice that they had a puzzle here that takes the night cycle into account. Otherwise, the cycle was really only noticeable back in the Shire, if you tried talking to other hobbits - they had different opening lines at night.